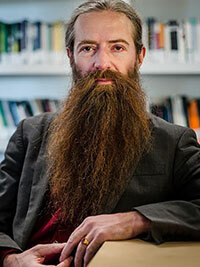 Dr. Aubrey de Grey (Ph.D) is an English author, biomedical gerontologist and a mathematician. He is currently the Chief Science Officer of the SENS Research Foundation and VP of New Technology Discovery at AgeX Therapeutics, Inc. He is editor-in-chief of the academic journal Rejuvenation Research, author of The Mitochondrial Free Radical Theory of Aging and co-author of Ending Aging. He is known for his view that medical technology may enable human beings alive today to live indefinitely. De Grey is an international adjunct professor of the Moscow Institute of Physics and Technology, a fellow of the Gerontological Society of America, the American Aging Association, and the Institute for Ethics and Emerging Technologies. He has been interviewed in recent years in a number of news sources, including CBS 60 Minutes, the BBC, The New York Times, Fortune Magazine, The Washington Post, TED, Popular Science, The Colbert Report, Time and the Skeptics’ Guide to the Universe, etc. He is also a member of Flooved advisory board.